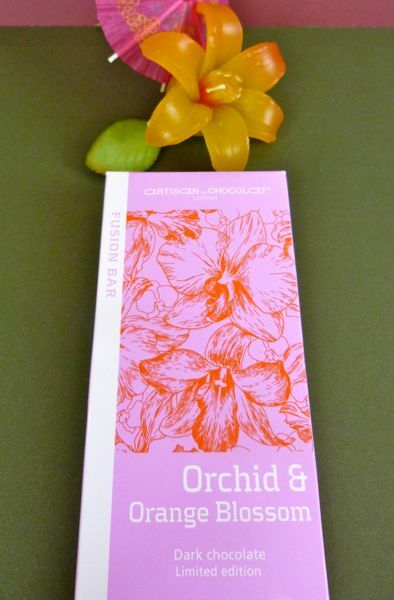 I'm enamored with floral flavors, so it was no surprise that I loved today's Orchid and Orange Blossom dark chocolate bar from Artisan du Chocolat (London). This limited edition bar was originally created for the Chelsea Flower Show Gala in 2010; and thankfully it is still available. Surprisingly, this bar made from a dark (72% cocoa) blend of "bitter" Venezuelan and "slightly acidic" Mexican cacao beans, did not overpower the floral notes from infused natural orchid and orange blossom extracts. The makers import their distillates of exotic flowers from Grasse, in the south of France -- a region known for its scented flowers that are also used in French perfumes. My only regret: not having Artisan du Chocolat's Carnation and Orange bar to taste alongside this one today. Look forward to featuring it in the future. 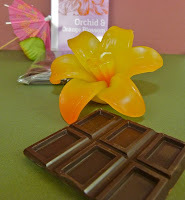 Today was Day #6 of Chocolate and All Things Orange Theme Week.